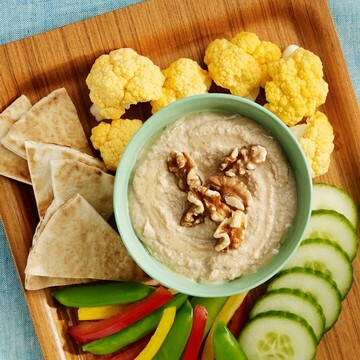 This citrusy, nutty hummus makes a great dip and spread. Try spreading it on panini made with grilled vegetables for a healthful, vegetarian sandwich. Toast walnuts in 350°F oven for 8 minutes or until golden brown. Cool to room temperature. Serve hummus in small serving bowl alongside toasted pita bread or with a variety of colorful raw vegetables. With tasty ingredients like these, who can resist this creamy delight? We're so glad you shared this healthy and delicious Toasted Walnut Hummus recipe on the Healthy, Happy, Green and Natural Party Blog Hop. I'm Pinning and sharing!